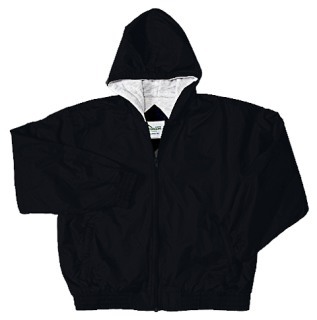 Adult size zip front water-resistant, hip-length nylon taffeta jacket is lined with lightweight brushed fleece for early morning warmth. Elastic waist and cuffs provide a snug yet forgiving fit. Attached hood w/ drawstring. 2 outer pockets, 1 chest inner pocket. Outer shell is 100% Nylon, inner liner is brushed polyester fleece. For Youth sizes XS-XL see style 53402.